Floral polyester jacquard front; striped back. Finished with gimp trim and a corded edge. Zipper closure. 26"Sq. Dry clean. Made in the USA of imported materials. Striped polyester jacquard front and back. Pleated silk trim. Zipper closure. 26"Sq. Dry clean. Made in the USA of imported materials. 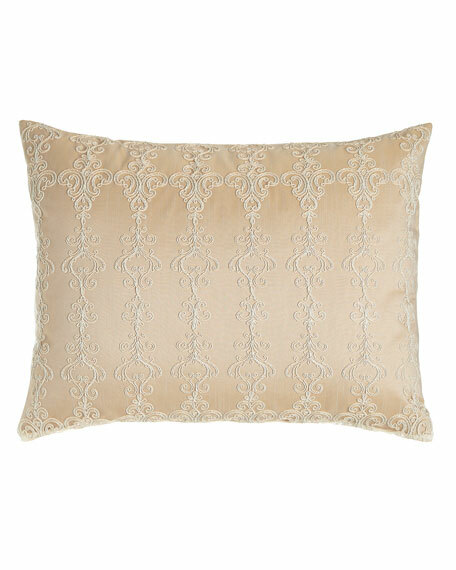 Long-staple cotton sateen sham with macrame lace inset. Lace inset is threaded with a narrow satin ribbon and bordered with hemstitching. 26"Sq. Machine wash. Made in Italy. Floral sham with 2" ruffle and matching back. Polyester. Zipper closure. 26"Sq. Dry clean. Made in the USA of imported materials.